Guarantees are commonly used to cover the risk of non-compliance by a contract party to fulfill agreed obligations (e.g. failure to pay or deliver). Guarantees can be used in open account trade as well as a complement to collections and documentary credits. A guarantee is a type of protection that one party in a transaction can impose on another in the event that the second party does not perform according to predefined specifications. In such an event, the first party will receive a predefined amount of compensation by the guarantor, which the second party will be required to repay. For example, an importer of cars in the U.S. can ask a Japanese exporter for a demand guarantee. The exporter goes to a bank to purchase a guarantee and sends it to the American importer. If the exporter does not fulfil his end of the agreement, the importer can go to the bank and present the demand guarantee. 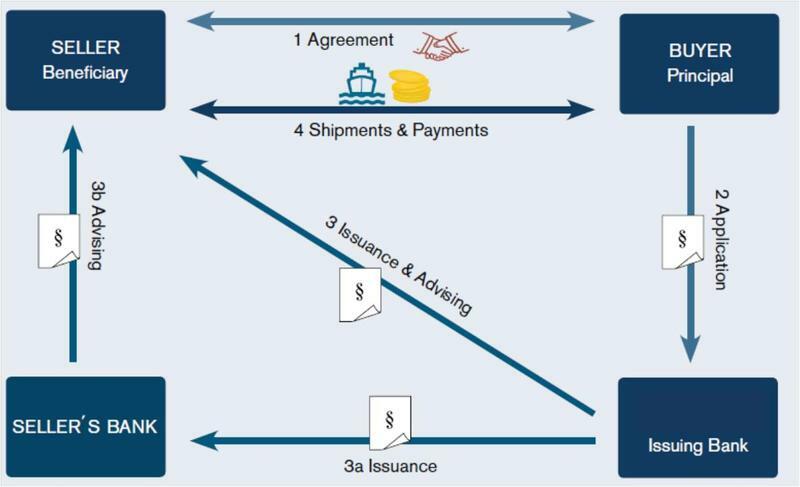 The bank will then give the importer the predefined amount of money specified, which the exporter will be required to repay to the bank. A demand guarantee is very similar to a letter of credit except that it provides much more protection. For instance, the letter of credit only provides protection against non-payment, whereas a demand guarantee can provide protection against non-performance, late performance and even defective performance. The International Chamber of Commerce (ICC) developed the Uniform Rules For Demand Guarantees (URDG) business practices that provide a framework for harmonizing international trading practices and establishing agreed-upon rules for guarantees among trading partners. The buyer and the seller agree on the terms of the contract. The buyer agrees to provide the seller with a direct payment guarantee to secure payment. The buyer will then apply for the guarantee from his bank. The buyer's bank issues the requested guarantee based on the information in the contract between the buyer and seller. The guarantee is then submitted to the seller directly from the buyer's bank as an original paper version (3) or electronically through a correspondent bankas "post office" (3a & 3b). The buyer and the seller are now ready to start trading. A guarantee is therefore normally used in order to secure the fulfilment of contractual obligations (e.g. delivery). When the seller and buyer have agreed on the contract terms, the seller might also need to define which of the terms are to be secured by a guarantee. If some of the seller's obligations are to be secured, the seller applies for a guarantee from his bank, which then issues the guarantee in favour of the buyer. Should some of the buyer's obligations need to be secured, the buyer will request his bank to issue a guarantee in the seller's favour. secured compensation for non-fulfilment of any important obligations.